When the Fukushima Daiichi nuclear disaster rocked Japan on March 11, 2011, it also caused ripples in Koodankulam, a tiny village on the east coast of India. Just two months later, the ripples turned to waves of anxiety and unrest, when a test run at the Koodankulam Nuclear Power Plant (KKNPP) produced smoke and loud sounds (described as being similar to the sound from a supersonic jet), accompanied by mild tremors. The village temple bells were rung, bells of alarm as it were. Koodankulam’s men, women, and children gathered at the temple and a decision was made. S. P. Udaykumar, a man who had spent the better part of his life in anti-nuclear activism, was to be consulted. The villagers needed to understand what went on in that dome-shaped mammoth structure by the sea. How would it affect their lives? Could they trust what the government was telling them? And above all, was it safe? Anyone from Koodankulam and the villages surrounding it will tell you that this story really began in the late 1980s, when the then Prime Minister of India, Rajeev Gandhi, and the Soviet Union President, Sergei Gorbachev, negotiated a deal to set up a nuclear power plant in the village. Two Russian water-coolant nuclear reactors were commissioned on November 20, 1988. The region, whose coastline has deteriorated over the decades, almost immediately woke up to anti-nuclear sentiments. But with delays in the construction of the plant following the untimely death of Rajeev Gandhi and the disintegration of the Soviet Union, the anti-nuclear protests, too, took a backseat. And then, in 2004, the tsunami struck the southeast coast of India. “Words cannot describe the kind of fear and helplessness I felt when the sea came rushing into the house. We had no place to run to.” As she spoke, Selvi, 39, looked out into the sea crashing at a distance from the safety of her house near the Koodankulam Nuclear Power Plant (KKNPP). “We helped one another. There was no government, no police, no rescue missions. If the government didn’t come to our rescue then, how do we know that in case of a nuclear disaster or another tsunami, they will help?” she asks. By the end of 2008, the construction of the plant was completed and the Indian government had negotiated with Russia for four more reactors. According to the people of the region, the public hearings of the Environmental Impact Assessment (EIA) report conducted by the Nuclear Power Corporation of India (NPCIL) were ineffective. The mandatory publication of the ‘safety measures’ in the Kanyakumari edition of Dinakaran, a regional Tamil newspaper, alarmed the people further rather than reassuring them. The protests had gathered momentum by August 2011, when the People’s Movement Against Nuclear Energy (PMANE), a non-profit organization led by Udaykumar, set up shop in a strategic location. At Idinthakarai, 6 km from the nuclear power plant. Idinthakarai is an idyllic village perched on the Gulf of Mannar, home to an ecologically diverse biosphere. 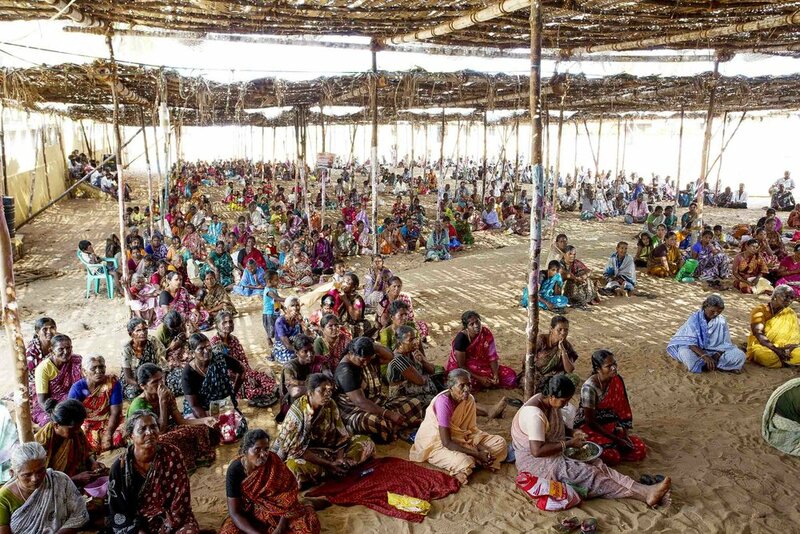 When the Tamil Nadu state government decided to turn its back on the protesters on March 19, 2011, after its initial empathy, the state police charged several cases of sedition, conspiracy against the country, etc., on villagers and leaders of the movement. They began to arrest the key activists in the region. A curfew was imposed on the region of Koodankulam. Koodankulam, with its vast drylands dotted with windmills and a highway rolling by, was no longer a safe haven for protestors. Idinthakarai’s location, however, gave them a strategic advantage. The fact that there is only one entry point to the village, which is closely guarded by the villagers, coupled with rumors about the villagers being armed with crude bombs, mean the police are reluctant to enter this zone. The flip side, of course, is that the protesters holed up here might never get a chance to leave. Idinthakarai is mainly inhabited by a fishermen’s community called Bharadars. Caste politics in the region had long caused rifts between the fishing communities in the region and the Naadars (who mostly inhabit Koodankulam and in towns further inland like Nagercoil). The protests, however, had more or less brought them together. S.P Udaykumar, originally from the Nadar community, was invited to lead the protests in Koodankulam while another activist, M. Pushparayan, 46, was invited to Idinthakarai, where he had served as a parish priest in the past. When both leaders decided to join hands under the umbrella of the non-profit organization, People’s Movement Against Nuclear Energy (PMANE), Idinthakarai was chosen as its headquarters, with the parish house serving as its office. The church is the center of all activities in Idinthakarai. A shelter was built in front of the St. Lourdes Mary Church of Idinthakarai. At any given time, it is occupied by small groups of protesters. On special occasions that call for a speech by one of the leaders, the front porch of the church turns into a stage. By night, the church grounds are a restive space where people come to pray on their knees at a grotto housing a replica of the Pieta. After long prayers, some of these villagers sleep on the sandy grounds: they are guarding their leaders who are camped inside the parish. The parish itself has a revolutionary air: men in their cotton dhotis sit around rustic wooden tables discussing world politics and nuclear power among other things as they sip lemon tea. Idinthakarai may not have an ATM machine, but the parish is equipped with a robust internet connection and a functional computer which makes sure that the movement and its people are not forgotten in this fast-paced world. Press releases complete with pictures and Facebook updates are dutifully sent out. However, Udaykumar and Pushparayan maintain that the real heroes of the anti-nuclear movement are the women of Idinthakarai. The storm was rolling towards the village from a distance. Soon, a few large drops splattered on the parched land. With the village more than half a mile away, and no shelter in view, Tamizharasi was still optimistic, “We will make it. There is nothing to worry,” she murmured. She was making her way to Idinthakarai. A few paces later a torrential rain poured down with a vengeance. It was a storm Tamizharasi simply could not outrun. Every day, for the past 630 days, women like Tamizharasi have been walking great distances to be a part of the movement. During the protests staged on September 10, 2011, the police had used tear gas and water guns on a peaceful demonstration in which women and children had participated. A total of 265 people, including six women, were arrested. The police kept the women in custody for two days without filing a case at the Radhapuram station, in Tirunelveli district. They were later presented at the Valiyoor criminal court in Tirunelveli district. Of the six women who were arrested, Selvi, Xavier Ammal, and Sundari were sent to jail. “A day in jail is a hundred lessons learned. A year is equivalent to a decade’s worth of lessons learned,” says Sundari Pendonpuss (37). She was incarcerated in Madurai for 98 days. For a woman who had never before lived outside of her home in Idinthakarai, Sundari remains surprisingly positive, “If you want to understand the world, go to jail. The world experiences are all there.” Her eyes well up when she talks about her family, particularly her children, who have had to suffer too. Yet, the women of Idinthakarai believe that it is for their children and their safe future that they are fighting. But the activism is not without a cost. According to the women, their interest in the anti-nuclear struggle is frowned upon by their mothers-in-law. Husbands are often insecure about empowered wives. What if they flout the men’s authority? “In the village, someone even said, ‘Look at her, she left her husband and children alone to go to jail,’” says Sundari. Male activists and their families, too, have had to pay a heavy price. Fifty-seven-year-old V. Rajalingam had been holed up in Idinthakarai for almost a year. He wasn’t sure he would be able to attend his daughter’s engagement and wedding, which was to happen in May 2013. The police would regularly visit his house in Koodankulam to enquire about his whereabouts. Stepping out of Idinthakarai would mean imminent arrest. “I had decided to try and sneak out of Idinthakarai and into Koodankulam at the first opportunity. But I didn’t want to promise anything to my daughter,” he said. On April 14, 2013, Rajalingam did manage to attend his daughter’s wedding without getting arrested.